I crocheted these stockings to 7 inches long and about 4 inches wide. I used a variation of this stocking pattern and just crocheted even on 29 stitches at the toe. I crocheted the heel and upper portion just keeping in the pattern shape with the additional stitches. I have crocheted this mini Christmas stocking so many times I can practically do it with my eyes closed. So it was easy to adapt to a bigger size. Just more stitches and more rows. 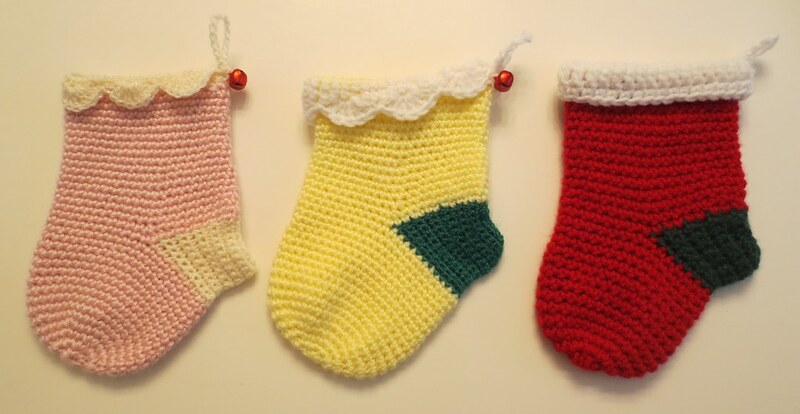 I love this size of Christmas stockings as they aren’t too big and are just perfect for a few little stocking stuffers. it`s so pretty. really a nice idea. It’s too beautiful and of course amazing idea. Thanks a lot for amazing ideas.